I’ve heard so much about Jaime Jo Wright’s novels. 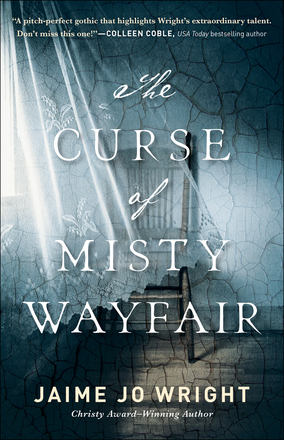 She’s made quite a name for herself with readers, so when given the opportunity to read her latest, The Curse of Misty Wayfair, I grabbed it. It sounded intriguing and spooky. It was both. This is a time-slip novel set in the contemporary moment and in the early 1900s, with a mystery that harkens back to the mid-1800s. There are two understated romances, but the emphasis is on a mystery that bleeds into the now, along with the growth of the contemporary heroine. Honestly, I’m still struggling to decipher my impression of this book. For me, it started slowly, but once it got rolling, it picked up speed. In general, the writing is superb—on the literary side at times (probably why I felt it was slow in the beginning). The author has a terrific way of sucking the reader into what appears to be a ghost story and tying everything up in the end in a way that (mostly) wasn’t expected. I must say I didn’t care for Heidi and had a hard time seeing her with Rhett. I kept wanting to say to him, “Ditch that girl. She isn’t for you.”. They were so different. The only commonality was in her need to feel loved, wanted, and protected and his personality trait as a protector. Otherwise, I found her too immature to really appreciate. On a positive note, I did like the way she related to Rhett’s sister. I also had a hard time keeping the ancestors straight—the grandparents, the cousins, etc., but I liked Thea and Simeon…and their roles in the kept-me-guessing mystery that ended in a twist I didn’t see coming. So, you see what I mean. I’m struggling. Even so, I can’t not give it 4.5 stars for the quality of the writing, the brilliance of the plot, and the fact that it kept me motivated to find out what was really going on in the story, which is a lot.